How can my store send inventory data to Locally? These are generic instructions for sending up your inventory feed. See below for step-by-step instructions for a number of the most popular systems. Log in to your POS system and generate a new report with just 2 columns of data: [UPC/EAN, Quantity on Hand]. You can also include a column for your store's price; this will be a supported feature in select parts of future updates. The report can be in .xls, .xlsx, .csv, or .txt. If you're using a .csv or .txt and can't use commas as your delimiter, we can also accept spaces, pipes, semicolons, or tabs. If you have multiple stores, generate one report per store, or you can create a single master file with store codes. Then, open your POS's scheduler function and schedule this report to run at least once a day, or as often as once every hour. Dropbox: our most popular method. Download Dropbox onto your computer and create a new folder, titled "Locally." Share this folder with dropbox@locally.com. Program your POS to drop your inventory reports into this folder. FTP: Generate credentials from within your account here. Alternatively, we can set up an FTP account for you to push to on a regular basis. Just let us know if you need an FTP account set up. Email: certain POS systems can email reports automatically. Each store in our system has a dedicated unique email address assigned to it that you can find in your locally.com account. Have your POS email your inventory files to this email address and you'll be all set. Web address: we can also pick up your file at a web address. Just let us know the link and we'll wire you up. If this is a Google product feed or similar, let us know which column contains the UPC/EANs (usually it's GTIN). If your POS system has no automatic scheduler function, you can manually upload your inventory report via your account, or through a shared Dropbox folder. Locally's retailer support team is happy to walk you through this. Contact us at retailers@locally.com or by phone at 504-533-0010 ext 1. I don't use UPC's or EAN codes. Can I still get on Locally? We require that a retailer use UPC's/EAN codes to be able to get on Locally and broadcast your inventory to online shoppers. If you're making your own barcodes, those are inherently unique to your store, so we can't match your products to our master catalog. If you're not currently using UPC's/EAN codes, this means transitioning to using UPC's/EAN codes in order to get on Locally. Transitioning to UPC's/EAN codes is a simple and ultimately highly rewarding process. We recommend starting by picking one of our partner brands that you carry and add their UPC's/EAN codes. You'll then set up your inventory feed for just that brand. As you continue to add more UPC's/EAN codes, your feed will automatically update with the new products. All of the UPCs/EAN codes for our partner brands are available for download in your Locally account. Login here, or create your account and click "Vendor Catalogs" to download to your heart's content. We've worked with countless retailers to switch to UPC's/EAN codes so they could get on Locally. Not a single one has ever looked back. Let us help you make a plan: retailers@locally.com. My POS Only Exports UPCs Without the Final (Check) Digit, Will That Work? Yes! Just let us know. We can make sure to automatically add the final digit to your UPCs when we process your UPC data. My Point of Sale system isn't listed here, can I still participate? Yes! Our inventory sync is Point of Sale system agnostic, by design. The systems here listed are official integrations that are utilized by enough retailers where we can provide step-by-step instructions or even click-and-activate applications and connections. If your system isn't listed, it means we either haven't encountered it yet, or we have but haven't yet been able to meaningfully compile information on how it works. Start by reviewing the generic instructions for how our inventory sync works. Then, email us to retailers@locally.com. Tell us which system you use and we'll dive in with you. I'd like to see how your system is reading my file, how can I audit my in-stock inventory? 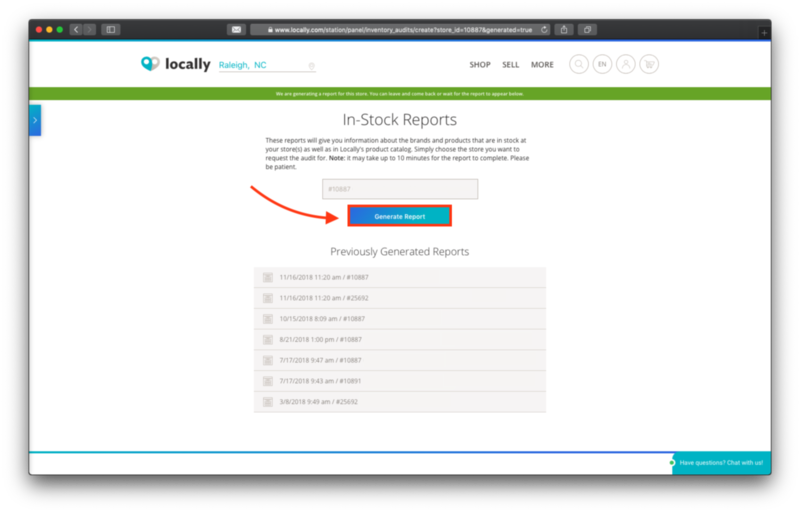 Here's how you can use Locally's stock audit function to troubleshoot your inventory file. 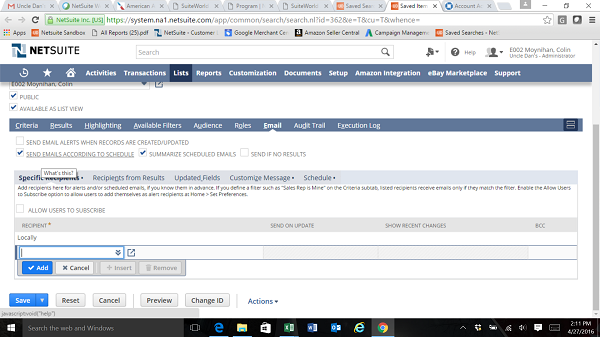 First, head to your Locally dashboard and select the In-Stock Reports tab. Next, choose which location you'd like to run a report for and hit Generate Report. You'll see a history of your previous reports below. Once the report is generated (it may take a few minutes), you'll be able to see a snapshot of how many UPCs were in your file and how many our system recognized. 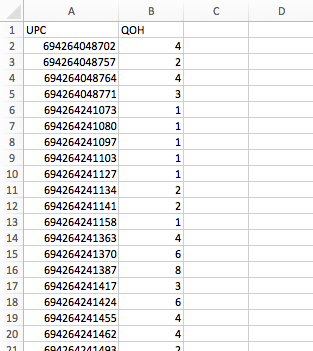 The number of UPCs checked is the total number of UPCs we are receiving from you. The number of UPCs that exist are the UPCs that are actually in our product catalogs. Any Ascend retailer can be live with inventory on Locally in minutes. Quickly set up a query that will automatically send your inventory to Locally daily. Simply follow these instructions and you'll be live! Contact retailers@locally.com if you have any issues. We have retailers that report inventory to Locally with Celerant. Download Dropbox onto the computer where your file will be generated. Create a folder called "Locally," then share that folder with dropbox@locally.com. If you'd prefer to use FTP, please email us for credentials. Contact your Celerant support and ask them to create a script to generate a file (.csv, .txt, .xls, or .xlsx) containing vendor UPC and quantity. Schedule the file to run daily (or more often) and put into the shared folder or FTP. Note that the file name and format must stay the same each day. Please feel free to contact retailers@locally.com with any questions. CREATING FILES: Files can be created from a SQL command and run as a batch file. Only create files for physical inventory. ADDING UPC DATA: Contact support@marinerbusinesssolutions.com. UPLOADS: Use AllWay Sync (Free) to move the files off the SQL server and to an FTP server or Dropbox. To use Dropbox, create a folder, call it "Locally," share it with dropbox@locally.com, and schedule your files to go to the shared folder. Please contact us if you would prefer to use FTP and we will send you credentials. TECHNOLOGY RESOURCES: support@marinerbusinesssolutions.com or (303) 692-8200. Log in to your Epicor POS and generate a new report with just 2 columns of data: [UPC, Qty on Hand]. It can be in .xls, .xlsx, .csv, or .txt. Then, open your POS' scheduler function and schedule this report to run at least once a day, or as often as once every hour. Each store in our system has a dedicated unique email address assigned to it that you can find in your locally.com account. From your dashboard click on the blue tab and go to Inventory > Upload Inventory > Email Method. Have your POS email your inventory files to this email address and you'll be all set. Please contact your Epicor POS support for help generating the report. Note: the ability to export is not a standard feature of IPOS, you may need to upgrade your software for a fee. Please contact your IPOS support for help generating and exporting the report. Do use Lightspeed Retail? Awesome! We offer a direct connection, which makes it simple to get live on Locally. Important! If you've already connected Lightspeed with Locally using an API key (before October 1, 2016), follow these same steps to update your connection to OAuth. Lightspeed will begin deprecating API keys in the near future, and you must update your connection to keep your inventory live! Select "Point of Sale Integration," then click the button that says "Lightspeed Cloud setup"
Follow the wizard's prompts, and you'll be live in minutes! Our Lightspeed Cloud connection pulls inventory from your system once a day at midnight, so any updates made during the day will be reflected on Locally the next day. Please contact retailers@locally.com with any questions during installation. ADDING UPC DATA: Lightspeed offers downloadable catalogs for hundreds of brands. 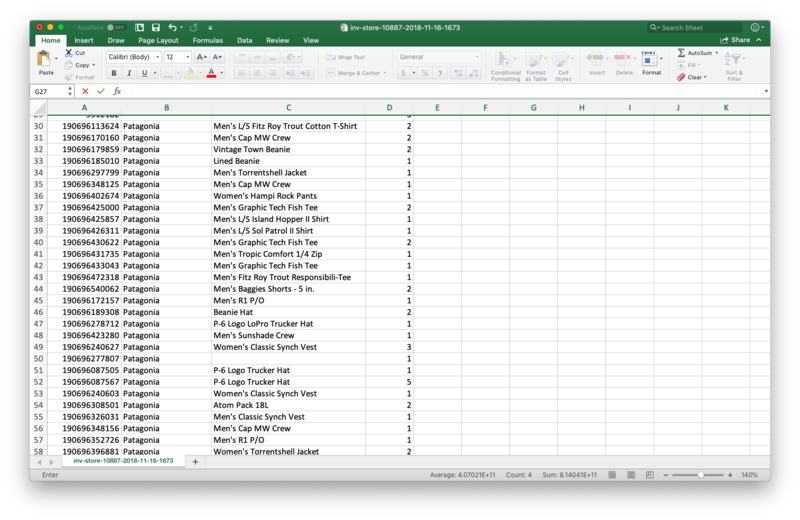 CREATING FILES: Using product view, select the fields you need (UPC), and run an export to Excel. Save the file as .csv or xls. For Onsite: Select Tools > Export > Products and filter the UPC and Inventory Quantity. Save as a .csv file. UPLOADS: You can use an FTP program to send files to our server, or Dropbox, or manually upload files in Station. TECHNOLOGY RESOURCES: Support is available from Lightspeed or 866-932-1801 with your support contract. Getting your inventory feed set up using LinkEdge is easy. Just email retailers@locally.com and ask to activate the LinkEdge + Locally integration. We'll work with LinkEdge to get you wired up and let you know when you’re live! Your LinkEdge integration will automatically update your feed every night. We have clients using MS RMS and generating daily data files. Please contact us for more information on the process of creating and uploading data from MS RMS. It's easy to create and schedule the Locally file in Netsuite. 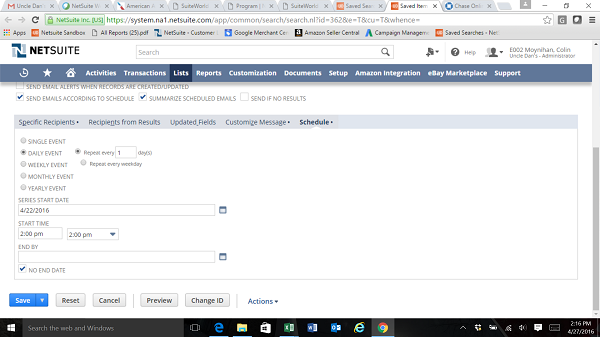 Netsuite emails Locally the file automatically, at your desired frequency. Please contact retailers@locally.com to receive a custom email address for your store to send inventory files to. Create saved search as Item Search. Set criteria using "location available" greater than 0 to show inventory currently on hand in desired location and use "inventory location: name" to define location. Set results using "upc code" and "location available" as only results. 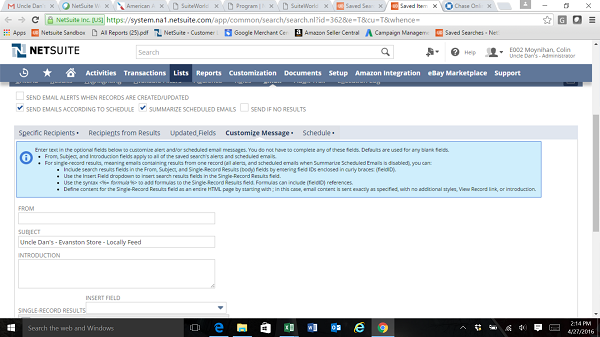 Go to Email subtab and check boxes "send emails according to schedule" AND "summarize scheduled emails". If you don't select the summarize scheduled emails, emails won't send correctly. Within the "specified recipients" subtab, set recipient as Locally. In order to do this, you must first create a vendor for Locally and enter the email specified by Locally staff in the vendor record. Once this is complete, you can select locally in screen below as the email recipient. Without first creating vendor record for locally, this will not work. 5a. Under "Customize Message" subtab, enter subject line so that Locally can determine which store the email is pertaining to. 5b. 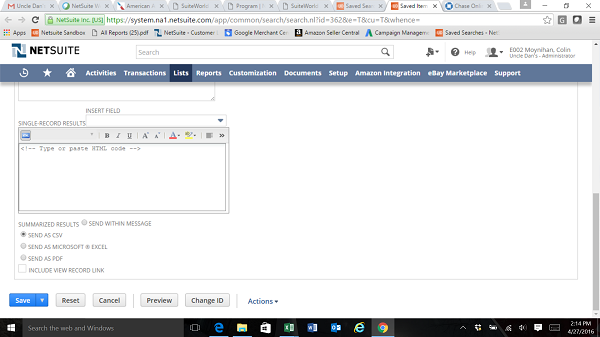 Under "customize message" subtab, select box to "send as csv." Under "schedule" subtab, set daily schedule to run. Click blue "save" button and this email schedule should be complete. Locally has worked with a number of retailers to integrate with POSIM. See below for more information, and reach out to support@locally.com for further support. Contact POSIM Tech Support- (800) 409-7678 or support@posim.com- for guidelines on adding or importing UPC’s to POSIM. If you’re new to using UPC’s, be sure to chat with Locally at retailers@locally.com about how to easily make the transition. You can create the report we need yourself in POSIM. If you need a hand, contact POSIM Tech Support: (800) 409-7678 or support@posim.com. You can create an automated report using Define a Report in POSIM EVO. This feature was released in January 2015, and is available in EVO 1.7 or higher. For assistance, or to have them set this up for you, contact POSIM Tech Support at (800) 409-7678 or support@posim.com. Update: Quickbooks Desktop 2017 now allows you to set up scheduled reports. Full instructions are available here. Quickbooks does not have a native automated report function, which means syncing your inventory is a very simple manual process. Open the Reports module and select "Define a New Report." For filters, there should only be two: [UPC, Qty]. This will run and save the report to your computer. Run this report for each store if you have multiple locations. Meanwhile, download and install Dropbox onto your computer. Create a new folder entitled "Locally" and share the folder with dropbox@locally.com. When Quickbooks generates your reports, find them and drag them into this Dropbox folder so that they overwrite the previous day's inventory reports. The file name must stay the same each day. That's it! Contact retailers@locally.com for more info on this process. ADDING UPC DATA: UPC fields are native to Retail Pro. There are also multiple UPC import tools available for version 8.x (bridge) that can help you automate the import of inventory data. See your Retail Pro dealer for more details. CREATING FILES: Retail Pro v8.x includes a reporting function and a easy to use application scheduler that can be configured to export a list of in-stock UPC's and Quantities as often as you'd like. 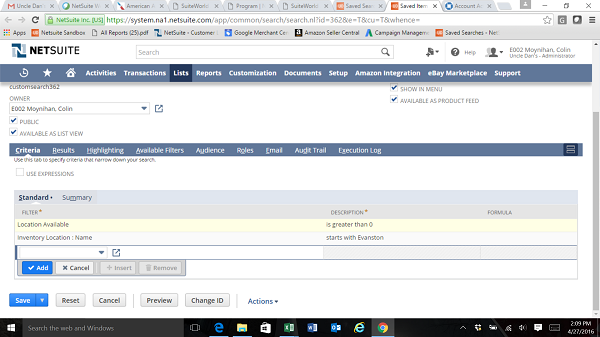 First, create a SUMMARY report for each of your stores. Give them unique names. 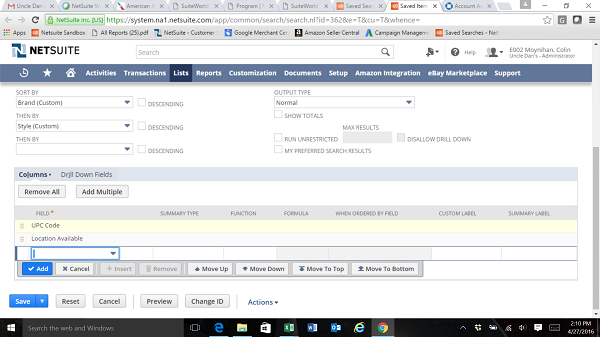 If you have multiple stores, you will need to set up a filter for each that defines the specific store's inventory. Once you have a report for each location, now, create a GROUP that contains all of your Summary Reports. Once you have set up Reports and Groups, you'll need to SCHEDULE them to be created. Open Scheduler and create a new job. Note that the Parameters are defined by your Group name. Make sure Scheduler is running at all times. Once scheduler creates the files, they will appear in the Print folder. Use Windows Task Scheduler to move files from \Retail\RPro\Print to DropBox. UPLOADS: If you need help automating the file creation or movement, contact your Retail Pro Support Team or one of the resources below. CONNECT DIRECTLY Our parter, TGE Software offers a dedicated V9 connectors. Find out more here. Locally will provide you with your client ID. ADDING UPC DATA: UPC fields are native to Retail Pro. There is an importer built in to v9. See your Retail Pro dealer for more details. CREATING FILES: Retail Pro v9 includes an export function that can be configured to export a list of in-stock UPC's and Quantities as often as you'd like. UPLOADS: See your Retail Pro dealer or a local technology export to learn how to upload reports to FTP sites or Dropbox. We have retailers who have successful setup their Retail STAR to feed in inventory to Locally. If you are a retailer who uses Retail STAR, please email us at retailers@locally.com for more information. Locally has a seamless, direct API connection with RICS that allows you to effortlessly broadcast your inventory. Locally receives two pieces of data from your store via RICS: UPC, Quantity on Hand. RICS transmits changes to your on-hand inventory quantities in real-time. So every time you sell a pair of shoes, RICS communicates that change to Locally in the background, to keep the availability we're displaying for your store as close as "up to the minute" as possible. The Locally/RICS integration is free and is utilized by hundreds of stores. To activate the integration, email accounts@ricssoftware.com and ask them to activate the Locally integration for your store(s). They'll have you sign off on an authorization, and then will put you in the queue to be activated. When they've activated the integration for you, make sure you switch every brand in your POS to "Sellable Online" for the inventory to flow to Locally. 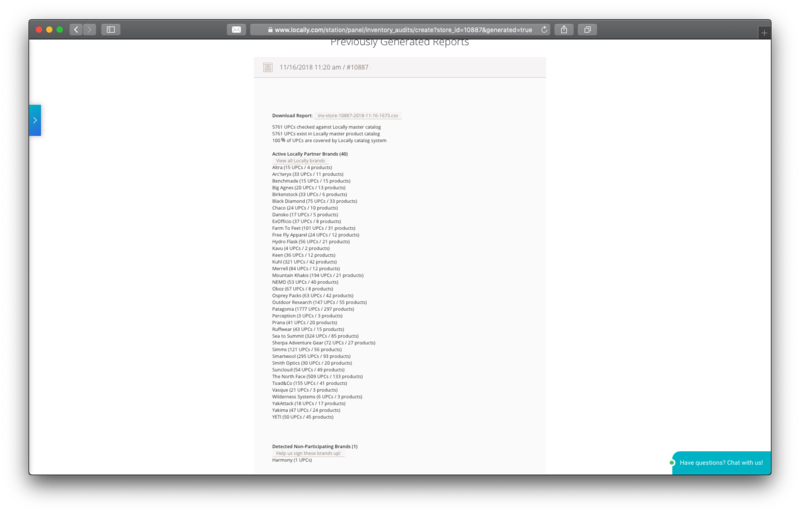 RICS only sends us data for brands that you have listed as sellable online. We recommend you set all brands to Sellable Online at this time, so when brands go live on Locally, your inventory will automatically start appearing. Locally does require the use of vendor UPC codes, as your store generated SKUs are inherently unique to your store. If you're not already using UPC codes, RICS makes it easy to import the UPC data into your system. Click here for an article from RICS on how to perform this task. Locally also hosts complete product catalogs for all Locally partner brands. 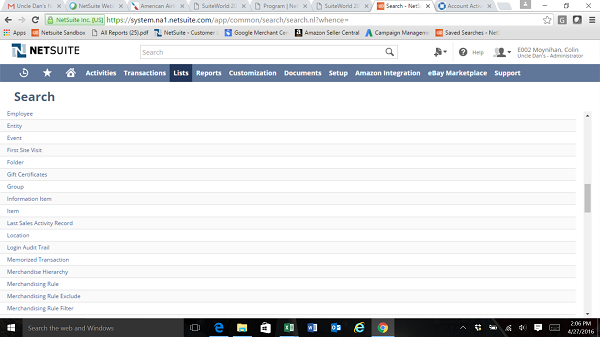 Login to your locally account, and on the left menu, select "Inventory" and then "Brand Catalogs." Download away! NEED TO REMOVE A SPECIFIC PRODUCT FROM YOUR FEED? First, load the style in RICS, and deselect "sellable online" for that product. Second, we need to reset your feed. To do this, email retailers@locally.com and tell us: "I need to reset my RICS feed because I need to remove [specific product(s)] from showing in my feed." We'll queue that reset with RICS and it'll be gone. We are actively working with Runit to connect Runit POS users inventory to Locally. If you are a retailer that uses Runit, please email us at retailers@locally.com for further instructions. 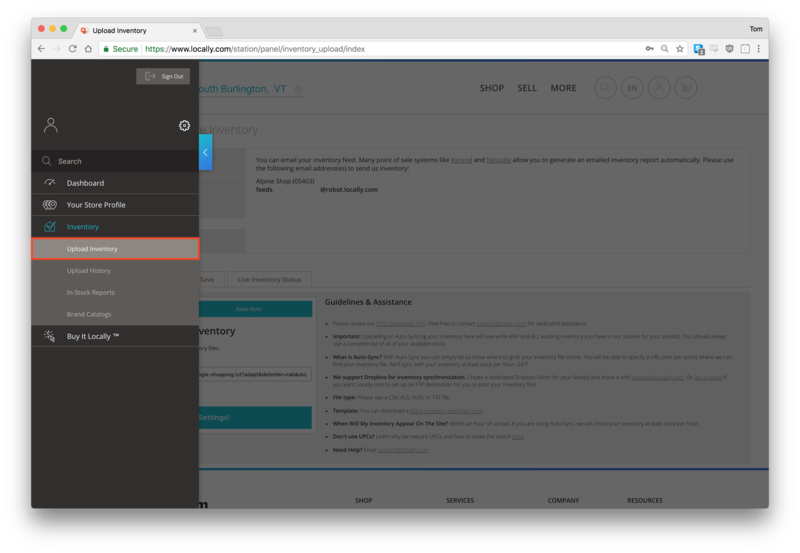 We have a Shopify app integration that allows you to effortlessly broadcast your inventory through the Locally system. Type in your store name as it appears in the URL when you're logged in to your Shopify store, and click "Install." Locally's Shopify connector pulls inventory every night at midnight, so any inventory updates you make during the day will be reflected the next day. Note that our Shopify connector only works for stores with one location. Please contact us if you are a multi-location retailer that uses Shopify to explore other inventory options. Please email retailers@locally.com for assistance during installation. We have retailers who are live on Locally using Shopkeep. It is a simple manual, once-a-day process to run the Locally inventory report and upload it into our system. 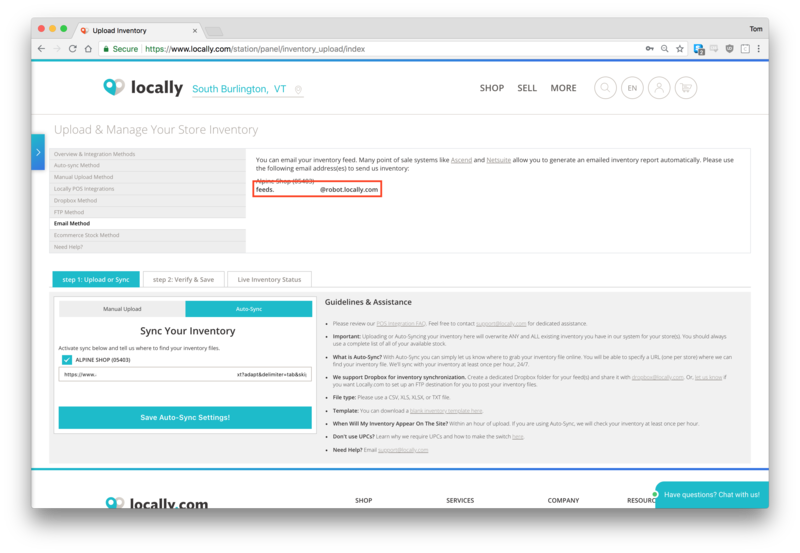 If you are a retailer who uses Shopkeep, please contact us at retailers@locally.com for more information. Important! SmartEtailing recently changed third party access permissions so that we can no longer "read" your inventory file. This means that this method is currently unavailable. We encourage you to send a request to support@smartetailing.com that they restore "read" permissions for Locally so that this issue is higher on their radar. 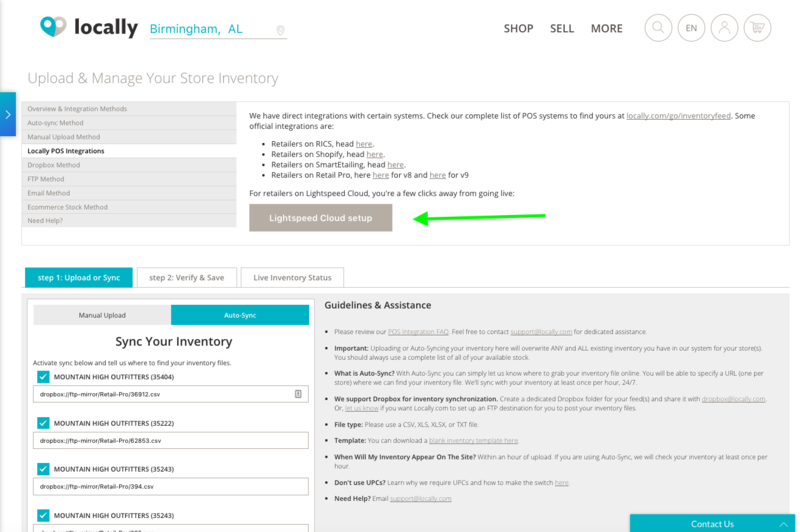 If you use Ascend or Lightspeed, please follow those links to connect your POS system to Locally and complete your inventory feed setup. We have a partnership with SmartEtailing so that any SmartEtailing user can seamlessly feed their inventory through the Locally ecosystem simultaneously. To get setup, simply email the FTP credentials you use for your SmartEtailing feed to retailers@locally.com. Specifically, all we need the FTP username and password. We take that and map it to your system, and you're live! Questions? Shoot us a note at retailers@locally.com. Do you work with Sportmas? If so, we can easily set up a connection that transmits your in-stock products to Locally daily. Simply contact retailers@locally.com and tell us you'd like to activate a connection via Sportmas. We have clients using Tallysoft and generating daily data files. Please contact us for more information on the process of creating and uploading data from Tallysoft. Locally has a brand new direct API connection with Teamwork Retail POS! To activate inventory for your store, please contact us and we'll get you going! My POS doesn't have automated reporting. Can I upload inventory manually? Yes! If you use a POS that does not support automatic reporting, it's easy to manually upload your inventory. Start by running a report from your system with just two columns of data: UPC and Quantity on Hand. If your POS does not allow to to specify which columns to export, export all columns and use excel to trim it to the two UPC/QOH columns Locally requires. 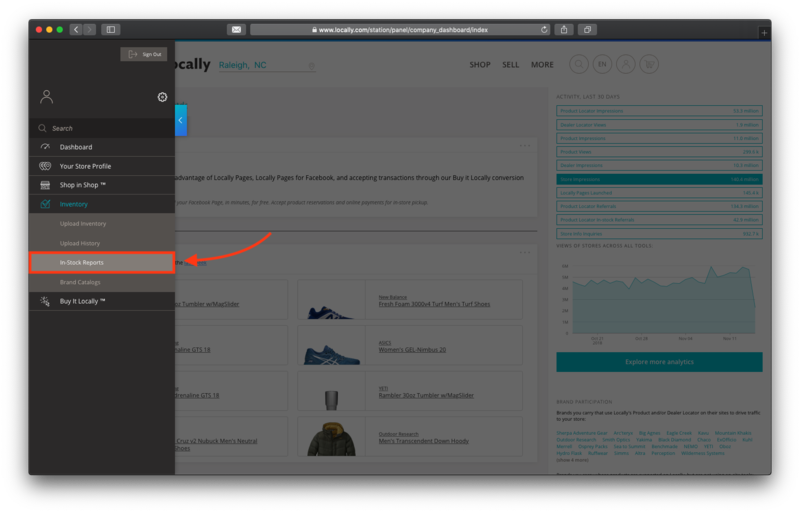 Then, login to your locally.com account and select "Upload Inventory" on the left-hand menu. Select "Manual Upload" and upload your file. That's it! Your inventory will refresh within the next 15 minutes. Aim to keep your inventory updated every 24 hours, or at least every 48 hours. After 72 hours of not receiving a new file, Locally will begin the process of purging your inventory so that shoppers aren't being presented with stale info. Contact retailers@locally.com for support. Many retailers utilize Dropbox to save time with their manual uploads. Learn more about this here. Make sure your file looks exactly like the screenshot above. Extra columns or rows- like headers generated by your POS, or additional product info- can cause an issue. Manually edit your file in Excel to look like above. Try re-saving your file as a .csv and upload again. Our system tends to like those the best. Make sure you are sending us UPC codes, and not your own store-generated SKUs or style numbers. UPC codes are typically 12 digits and provided by your brand. You can download UPC codes for any participating brand in your locally.com account. Still having issues? Email retailers@locally.com and attach the file you are trying to upload. We'll pin down the issue and get you going! How can I utilize Dropbox for manual uploads? If you're uploading your inventory manually, you can use Dropbox to save time. Locally can sync with a shared Dropbox folder on your system. Instead of having to login to your locally.com account to upload inventory, you simply drop your new file into a Dropbox folder and Locally will do the rest. Download Dropbox onto your main computer where your POS is located. Create a new folder "Locally" and share the folder with dropbox@locally.com. Drop your inventory file here and give it a file name that is easy to use every time. Email retailers@locally.com and let them know you would like to complete your setup. We will setup our connection with this folder and enable your inventory. Once this is setup, you can run your inventory report and save it into the dropbox folder. The file name must always be the same, so that it overwrites the previous file. If you change the name- even by adding an extra letter or an extra space- our system will not recognize your file. Our Dropbox sync runs every hour, so your inventory may not immediately refresh.